WILMINGTON, Del.--(BUSINESS WIRE)--From planning and budgeting to daily activities and dream vacations, men and women interpret travel goals and roles differently than their partners, according to a new survey released today by Chase Ultimate Rewards®. The survey reveals that while eight out of 10 couples plan to take a vacation together this summer, interesting ‘he said, she said’ contradictions suggest men and women lack an understanding of what their significant other looks for in a vacation. 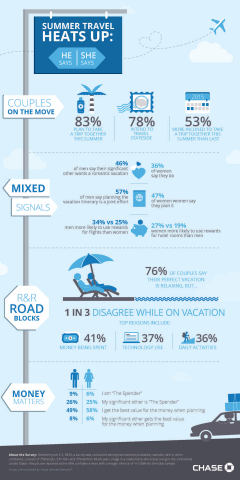 Half (53 percent) of couples are more inclined to take a trip this summer than last summer due predominantly to an increase in disposable income and paid time off. Both men and women are quick to label their partner as “the person who tends to spend money easily.” Even though a quarter (25 percent) of those in relationships label their significant other “The Spender,” only 7 percent self-identify as such. Women are more likely to say they get the best value for their money when it comes to travel. While 58 percent of women think they make decisions to get the best value for their money when traveling, only 8 percent of men and 6 percent of women think this to be true about their significant other. The majority of women (47 percent) believe they are the ones who develop a trip’s itinerary. However, 57 percent of men say it is a joint effort. Seventy-six percent of couples said a perfect vacation is relaxing, yet one in three couples disagree while on vacation. Their significant other spends more time than desired on a cellphone or other technology for work or personal reasons (37 percent). Concerns over how much money is being spent while on the vacation (41 percent). Data suggests two-thirds of couples often pay for trips with their travel-related points or rewards (68 percent always or often), actively seeking opportunities to use rewards to save money. 36 percent of respondents, specifically those ages 35-44 (41 percent), say they always use a credit card with travel-related points or rewards for trips. Men are more likely than women to use rewards for flights (34 percent versus 25 percent). Women are more likely than men to use rewards for hotel rooms (27 percent versus 19 percent). The nationwide phone survey commissioned by Chase Ultimate Rewards reached 750 Americans (18-65 years old) who are in a relationship and who travel. Chase Ultimate Rewards allows Chase customers to redeem points for travel, gift cards, cash, experiences and more. To meet the needs of couples traveling this summer, Chase Ultimate Rewards provides curated travel content and in-depth travel guides for destinations around the world with recommendations for hotels, restaurants and activities. Between June 1-5, 2015, a survey was conducted among two national probability samples, which, when combined, consists of 750 adults, 371 men and 379 women 18-65 years of age in a relationship who travel, living in the continental United States. Results are reported at the 95% confidence level, with a margin of error of +/-3.58% for the total sample. Chase is the U.S. consumer and commercial banking business of JPMorgan Chase & Co. (NYSE: JPM), a leading global financial services firm with assets of $2.6 trillion and operations worldwide. Chase serves nearly half of America’s households with a broad range of financial services, including personal banking, credit cards, mortgages, auto financing, investment advice, small business loans and payment processing. Customers can choose how and where they want to bank: More than 5,500 branches, 18,000 ATMs, mobile, online and by phone. For more information, go to Chase.com.